More than five million women live with PCOS in the US alone, and the condition can be debilitating. What lifestyle changes can you make to reduce your PCOS symptoms? More than five million women live with polycystic ovary syndrome in the US alone. Genetics, hormones, metabolism, environmental factors, and even epigenetics have been implicated in causing it — and many of those factors are completely beyond a patient's control. Nonetheless, proactive lifestyle changes can help alleviate your symptoms. What do you need to know? More than a third of all PCOS patients may also have insulin resistance — meaning their bodies aren't able to use insulin well. That has far-reaching consequences, as proper insulin functioning regulates blood sugar levels and helping the body know when to absorb sugars for energy. If you're one of these women, you should aim for a low glycemic index diet, making which promote proper insulin release, in turn helping you control your blood sugar levels, boost your energy, and lose weight. Look up the GI index of foods while you're planning your meals, but definitely avoid simple carbs. These carbohydrates — ubiquitous in things like white flour, pasta, rice, potatoes, and refines sugar — have a high glycemic index and cause blood sugar fluctuations as well as weight gain. 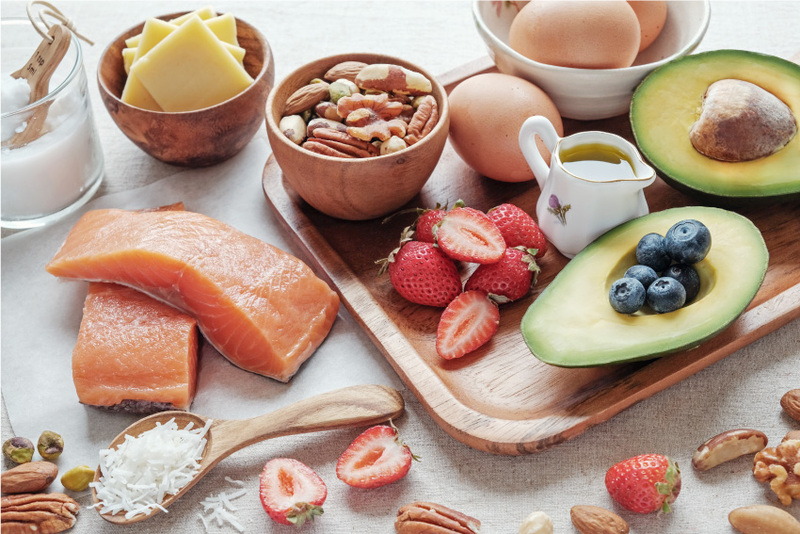 There's more to keeping your insulin levels steady than avoiding certain foods — it's also key to consume roughly the same quantity of proteins and carbs, as well as to include healthy fats in your diet. When you do eat carbs, complex carbohydrates found in veggies and whole grains are the best choices. Pick foods from all major food groups, and add as much variety to your diet as you can. Some of the best sources of fiber include broccoli, celery, leafy greens, apples, and whole grains. PCOS patients aren't advised to go on a restricted-calorie intake, which can lead to cortisol production and even more inflammation in the body — so don't just cut down how much you eat, but eat what you already do over the course of more meals — think six smaller meals rather than three big ones. This helps keep your blood sugar levels steady, and boost your energy levels in the process. 5. Could food packing be harming you? Think about it — unless you do much of your shopping at the farmers' market, nearly every food item you buy is wrapped in some kind of plastic. Not only is this bad for the earth, it might be bad for your PCOS as well. Plastic wrapping may contain chemicals like BPA, which can wreak havoc on your hormonal balance. Called endocrine-disrupting chemicals (EDCs) , they're even being researched as a potential contributing cause of polycystic ovary syndrome. The take-home message here is to try to cut down on foods and beverages that come in plastic packaging. 6. Bad news for coffee lovers? The jury's still out on this one, but it's something to consider. There is some evidence that caffeine, including coffee obviously, has negatively impacts your insulin sensitivity. Caffeine also seems to have an impact on estrogen levels, interesting elevating them in some ethnic groups (Asians) while lowering them in others (Caucasians). It is possible, but not certain, then, that drinking caffeinated drinks negatively impacts your PCOS symptoms. You could try switching to decaf for a while to see if it makes any difference. 7. Stress reduction: An important way to reduce PCOS symptoms? If you have polycystic ovary syndrome, you're at an increased risk of developing depression and anxiety — which can in turn impact your PCOS symptoms, as you'll find it hard to sleep and move. Even if you're not depressed, relaxation techniques that reduce your stress levels will give you the advantage of lowered cortisol levels. This stress hormone is often present in larger doses in women with PCOS, and it is another thing that messes with your insulin levels. Anything that helps you feel less stressed is good. Regular exercise is, of course, recommended to nearly everyone — not just people with PCOS. Working out regularly has some unique benefits for you, though, as it will help fight insulin resistance, boost your metabolism, and help you lose or maintain weight. Try to include both strength training and cardio in your workouts, but ask your doctor before starting a regime as overdoing it comes with its own risks — in the form of increased inflammation. Thirty minutes of yoga, walking, or swimming every weekday is safe for most people. 10. Yoga: Stress relief and exercise in one? One study of girls affected by polycystic ovary syndrome strongly indicated that yoga — a mind-body technique that combines working out with meditation — is a better way to reduce PCOS symptoms than regular old exercise, no matter the person's weight. Yoga relieves tension, improves your breathing, helps you lose weight while strengthening your muscles, and may have a beneficial effect on your hormonal balance. I'm 15 years old, and I think I have ED! consequences of an abortion, being dry?